Experts in senior nutrition recommend people over 65 include plenty of fruit in their diets. However, some fruits are considerably healthier than others, and strawberries are a perfect example. A trusted Harrisburg elder care provider wants to share a few reasons why your elderly loved one might want to add strawberries to his or her grocery list. According to a 2002 glycemic index published by the American Journal of Clinical Nutrition, strawberries contain slow-release carbohydrates that make them a great food for diabetics. Seniors make up almost a quarter of the diabetic population. If your loved one is among the many who have this condition, strawberries can help control his or her blood sugar levels. Strawberries have more vitamin C than oranges and more potassium than bananas. This is because they’re full of antioxidants. WebMD lists strawberries in the top 20 fruits for antioxidant capacity, and they outrank just about every other kind of berry in this regard. Their antioxidants are called polyphenols, and they can provide your loved one with everything from fiber to magnesium. Whether your loved one is hoping to regulate bowel movements or lower blood pressure, the antioxidants found in strawberries can help. The Salk Institute for Biological Studies conducted a study in 2011 that concluded the fisetin found in strawberries promoted cognitive function through the growth of neurons. Fisetin is a natural flavonoid found in berries, particularly strawberries, and it can help your loved one remember things more clearly and for longer periods. The same study from the Salk Institute also found fisetin reduced anxiety behaviors in mice. Instead of panicking when placed in large, unfamiliar environments, they were relaxed and open to the new experience. This suggests the fisetin in strawberries may have naturally occurring antianxiety properties. 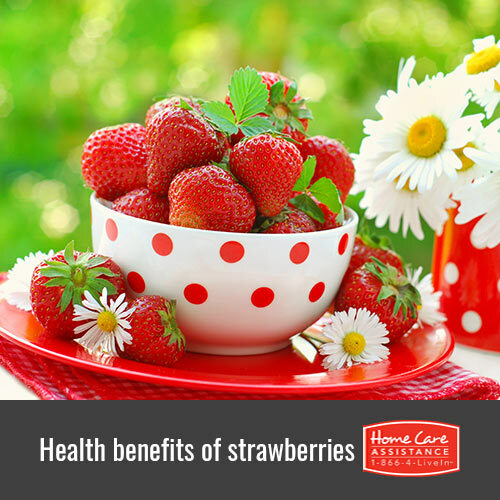 If your loved one is easily overwhelmed and stressed, a healthy dose of strawberries might help him or her remain calm. Helping seniors maintain a nutritious diet is one of the top concerns at Home Care Assistance. We encourage healthy eating habits, and our caregivers can shop for your loved one’s groceries and help him or her with daily meal prep. We also offer specialized Alzheimer’s, post-stroke, and Parkinson’s home care Harrisburg families can count on. For more information on our senior care services, call one of our qualified Care Managers at (717) 540-4663 to request a no-obligation consultation.